Once again we had a good turnout of volunteers to work on the various projects. The weather was warm and muggy, and we all fully intended to make good on Steve's suggestion to take the newly licensed Model Ts and motorcycles to lunch at Edna's in beautiful downtown Kingsbury. It was a comical adventure…. As usual, T-2 sat idle as work progressed on T-1 - mostly due to the fact that T-1 is still catching up in the fuselage area, though the gap between the two has narrowed considerably! Ron Marcotte and Steve Richardson spent the entire day reassembling the T-1 belly former parts. Sounds simple, eh? Except that the belly former was disassembled probably two years ago so several of the damaged formers could be repaired or made from scratch. This was like a giant 3-D jig-saw puzzle. It helped that Ron had been part of the disassembly team! They started by getting all the formers sorted by size and lightly fastened into place on the lower longerons. Once those components had been placed the stringers were put into place and juggled around until they all seemed to be in the right slots. That was followed by some additional repair and replacement, mostly of stringers. At the end of the day the whole assembly had been put right, and was glued and nailed. Next steps will be sanding and varnishing the belly formers and turtledecks for both T-1 and T-2. 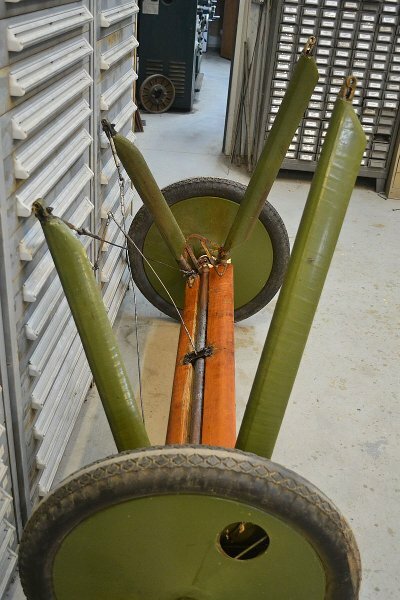 In addition it will be time to refurbish the main landing gear for both T-1 and T-2, though T-1 will still be the more difficult to tackle, as additional cleaning will need to be done to T-1's gear. Still, I managed to get a fairly good photo showing T-1's gear after Kevin Monahan worked on it the previous workday. I had no idea the spreader bars were wood!! The only other Tommy work was Kurt Maurer and Tom Gaylord made foot straps for T-1's rudder bar. 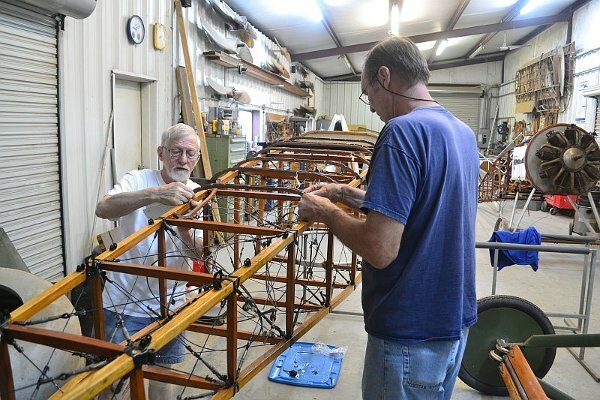 That assembly will be ready for installation next workday; though it is doubtful the airframe will be ready for the rudder bar…. Dave Orloff tackled the task of trying to figure out why the air speed indicator in the Rearwin Sportster seems to incorrectly show the air speed. The prior workday John Goble had a shot at it and it seemed that there likely is a clog somewhere in the line. Dave started off by tracing the line and found, in typical aviation fashion, that the line's routing is anything but straightforward, with connections in very out of reach locations! The air speed line comes off the pitot tube and goes straight back to the rear spar then cuts inboard towards the cockpit. The plastic tubing and metal pitot tube seem to meet mid-chord, where there are no access plates. There are no access plates along the rear spar either! Apparently the circuitous route is designed to work around the fuel tanks. We'll need to see what guidance we get from Steve or John on how to tackle this issue…. The bad news is that at the end of the day the engine still wouldn't start, but we seem to have taken a giant stride forwards to getting the motor running again! Most of the day's effort was geared towards ensuring that the valve timing was correct and the valve lash correctly adjusted. 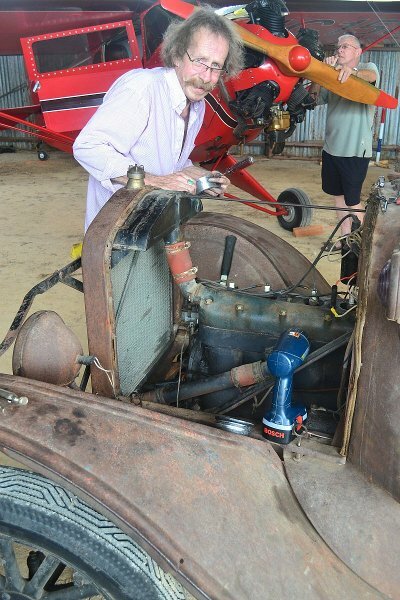 First steps were to remove the prop, engine cowling and engine face plate, exposing the cams. After adjusting those items (essentially moving parts so all the timing marks lined up when cylinder #1 was at TDC) the valve push rods were adjusted so the valve lash was correct. For ease of use a snack bar wrapper was used as a feeler gauge! 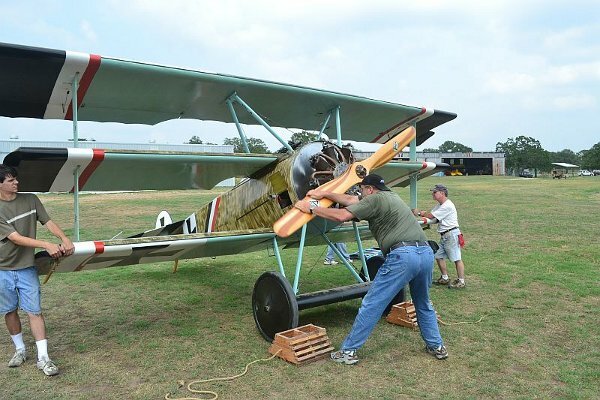 Eventually it was felt the engine was ready to rock'n'roll, and the airplane was buttoned up and rolled out to show center! Big Dave gave his mightiest swings but the motor refused to start, much less actually run. Dave says the engine now feels normal when he is propping it, so the common consensus is that we are one step closer to coaxing the engine back to life. The theory du jour about what needs to be fixed next is that the magneto probably needs to be timed to the engine, it is likely off. Stay tuned for Episode 42 in the continuing saga of “As The Rotary Turns”!! The big adventure was Kurt Maurer spearheading the effort to repair the TT's bed. It took six people to get the bed off and turn it over. Kurt and Terry Bledsoe installed a new plate on the truck bed to replace the incorrect system that had been securing the bed to the truck's frame. The search has started for the correct U bolts that secure the bed to the rear of the frame to fix the problem correctly. As usual the goal of Team Vehicles is to not only fix any defect that shows itself on the T's but to make it correct! Replacing the crank pulley on the wrecker turned out to be a much bigger project than anticipated because the pin that came with the part just would not work. After much gnashing of teeth by Kurt Maurer and Lynn Howell, David Whitaker modified the part and hopefully the installation can be easily completed next workday. Cameron Whitaker worked on the signal corps truck and improved the ignition with a few custom parts, but as usual with improvements this has had a domino effect which challenges other parts. A new distributor rotor is needed and will be obtained prior to the next workday. David Whitaker took apart the 1918 Indian motorcycle kickstart and mechanisms and we have major issues here! Sometimes parts just wear out or they can rust when they have sat out uninstalled for years and were "used” to start with! It appears that the Indian needs new clutch plates, as well as a kickstart pinion gear! The search begins. After the day was complete Al managed to install the new custom seat post on his “Hardley Davidson” tribute bike. This seat post was designed and fabricated by Al's cousin, Brent, and it is designed to hold Al's weight. Al tested out the new component and is delighted to report it seems to work very well indeed! Cameron used the cone wrenches Al bought to fix the wheel wobble on the Kingsbury Special/Flyer tribute bike. Al is very pleased with the two bikes as well as the education guys like Cameron Whitaker and his cousin Brent have given him during the course of the project! The comic relief of the day started at lunch break when a bunch of the guys took the newly licensed signal corps truck, French ambulance, and the 1921 Triumph motorcycle to Edna's for lunch. Like the road trip in "Animal House" not everything went according to plan! The Signal Corps truck, piloted by Dave Edgerly and Dave Orloff actually went to Edna's. The French ambulance, driven by Cameron Whitaker with Terry Bledsoe riding shotgun, and the 1921 Triumph motorcycle ridden by Ian Whitaker with Ron Marcotte flying wingman in his minivan drove past Edna's and ended up at Lola's Mexican restaurant halfway to Seguin. Meanwhile, Steve thought he'd seen the ambulance turn towards Luling, so he was patrolling the streets of Luling looking for a lost 1918 Model T French ambulance! Eventually it all got worked out and everyone made it to Edna's, but we ended up eating in shifts because we showed up at different times. The French ambulance suffered some issues on the way to Lola's, and the Signal Corps truck had a broken wire in the ignition upon departing Edna's. Ultimately, however, everyone made it back to the Aerodrome intact and everyone seemed to enjoy the adventure!